JAYGOW1 needs help in Ohio !!! 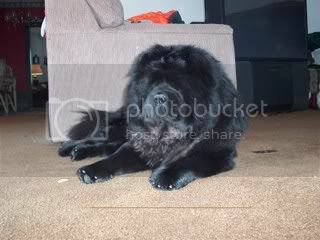 Share your experiences of rescuing a Chow Chow from this site. 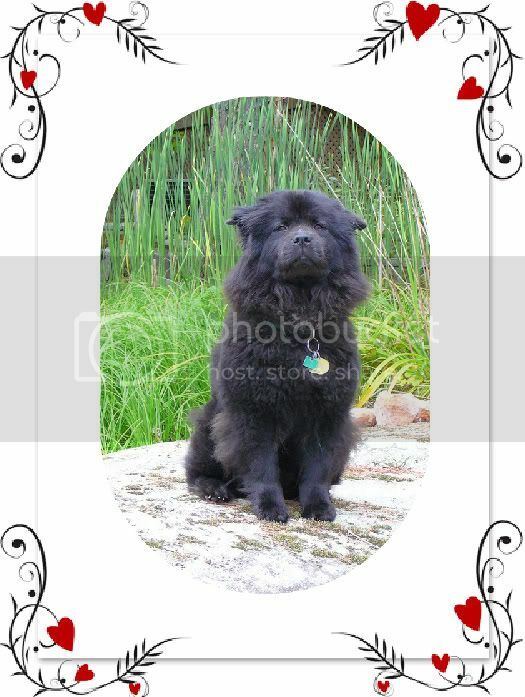 There was an ad in my local paper, in the lost & found section, for a black female Chow. I called the poster, and he explained that she had been hanging around about 2 weeks, and was running with a female Boxer. He said that she was timid, and nippy at first, but has been hanging around on and off the last week. She was now at the point where they could pet her, and she was wagging her tail. They had a couple of inquiries, but no leads. She has a collar, ( no tags ), and an ancient flea collar. I explained that I new some great folks across the country that have dedicated their lives to finding homes for lost/abandoned Chows. He REALLY wanted her GONE, so I went and picked her up. She let me walk right up and pet her, and I put a leash on her collar, and she jumped into the car. She rode very nicely, in the passenger seat, and din't mind the ride. When we got her home, she tinkled in the back yard, the was excited to get to come in the house. She jumps right up on the couch, as if she's been there before. I went to PetsMart, and got some Nutro, flavored rawhides, and beggin' strips, then I figured that she had enough for one day, so we just sat with her and petted her for the evening. She did enjoy a rawhide before bedtime. I slept on the couch, as she laid on the floor. When we woke up, I took her out on the leash , and she tinkled again, and went for th edoor to get back in. I don't know if she was sprayed by a skunk, or just has months of STINK embedded in her coat, but I gave her a bath with some shampoo that the girl recommended. She is matted, mostly around the neck, ( stupid flat collar ), and has some "undercoat" left on her hind end. She has some mats behind her ears, but not too bad. Unbelievably, she let me pick her up and put her in the tub. She wasn't real thrilled about it, but tolerated it. She did quickly nip at me last night when I tried to help her up on the couch another time, but quickly gave me kisses, as I think I just startled her. I did cut out some of her mats, and her hair is REALLY soft after the bath !! She has very pretty teeth! I want to do the right thing here. I need to find her a GREAT home !! Should I get her a vet appointment and get her checked out before someone receives her ?? 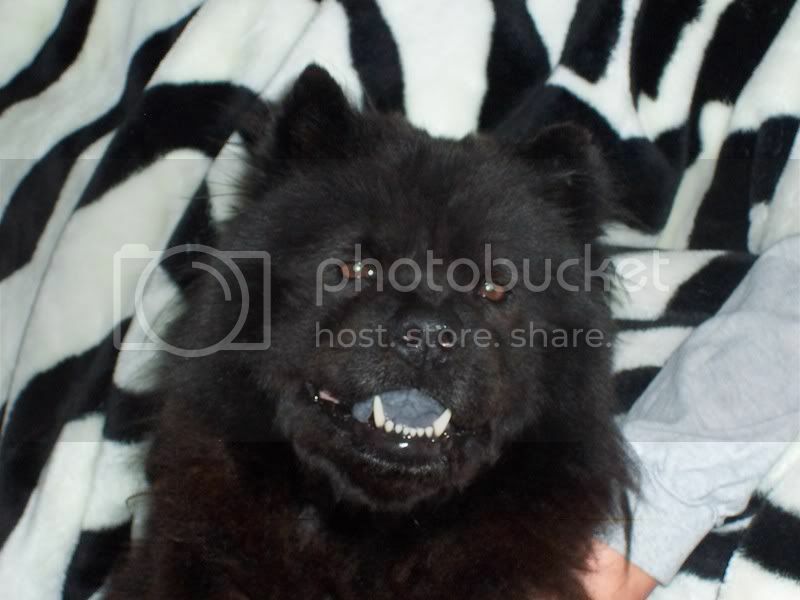 Do any vets in my area help with expenses on "rescue" Chows ?? I have no idea how old she is, or if she is fixed.I do know that she follows me EVERYWHERE , and wags her tail when spoken to by anyone. I haven't heard her bark yet. She likes belly rubs, and doesn't mind being brushed. Doesn't seem real crazy about the leash, but does let me take her outside on it. We went for a walk and she even pooped today !! I will attach some pics, and wait for advice. I am willing to travel a little bit to get her a home, and would like some guidance to make sure I don't screw this up. She seems to be a good girl, and deserves a better fate than she's had. She likes togo in the other room and take her naps. Just like Khon, she likes to be left alone sometimes. Please someone help her !! I really miss my purple kisses!!! RIP Bear, my bestest friend EVER !! Khon,you were taken WAY too early ! Awww, how sweet of you to have got her. I wonder if there is anyone looking for the lost girl as we were for Molly & Buttercup? Have you contacted the local humane society, chow rescue or PetHarbor to see if anyone's looking? Spca/rescue might be able to help you on vet cost, you can only ask. They might have a clinic/cheaper vaccination programme going on which might work out cheaper than a taking her to a regular vet, or they might have agreements w/ some vets for discounts. If you need help w/ costs, be open and tell us all, a little bit by each could reach a good amount. She looks very young. Kudos on you for taking her in. In the meantime, drown her with your TLC. She is such a cutie. What a pretty girl. Looks like she was well socialized at some point. I'd really check to see if someone isn't looking for her, doesn't sound like she's been on the street too long. Maybe look for someone looking for a boxer and a chow since she was running with the boxer. Also the picture where she's on her side; it looks like she may have a scare from being spayed but only a vet can tell for absolutely sure. (and they should be able to do it without opening her up! sorry that happened to one of the rescues here). Her front teeth look good, can you see her back ones are they just as white and clean? If they are she's either pretty young, less than 3 years or they've been recently cleaned. Which would mean she got pretty good vet care. It is a good idea to take her to the vet if at all possible, before trying to find her a home. That way you can tell the potential adopter her medical status. Being uptodate on shots is a plus, being already spayed is a plus, just for your peace of mind if no other reason. And if you can't keep her until you find her a home, I'd contact the Ohio or other nearby rescues to see if they have openings to foster or place her. She has been on the run for two weeks, and a newspaper ad ran this week. I'd hope that if someone lost her, that they would be smart enough to check the "lost and found" in our 2 local papers. Also, I would think that the dog warden would suggest that to anyone calling and looking for a dog. The Boxer was claimed by the owner and wasn't related to teh Chow !!! For some reason, no one is looking for her. She is a cutie ! She is lovely, a real sweetie by the sound of things a well. How lovely of you to take her in. I reckon a vet visit as well, then you could ask them to check for a microchip as well as vaccinations etc etc. i would be very happy to chip in for the cost if you can't get help from spca. Let us know. Call around to some vets and let them know your situation. Some will offer a discount or even a free visit because she was a stray and you rescued her. Then you can better figure out her health status. She definately needs to be checked for a microchip too. From the looks of the pictures, she must have been someone's indoor dog. She seems really comfortable inside the house. She looks happy to be with you in the pictures. Hopefully you can find her original owners, and if not, then you can find her a fantastic home. It is great of you to take her in. Bless you for saving this cutie. We had a similar circumstance. My son found a homeless chow in a bad way. He took him to an emergency vet and attempted to find his owner but was not successful (even though the dog was microchipped). That was two years ago and now that dog lives with us and I wouldn't give him up for anything! I can't imagine it would be difficult to find a home for her. I would love to take her to add to our pack! Good luck. I went through all the ohio craigslist, I'm sure she is full chow but you never know. My shep. chow mix, medium size and very friendly went missing awhile ago! She was around Harrison ave and Westwood northern Blvd. She is so sweet and not afraid of a thing!! Please help me! She is very pretty...actually looks a lot like Tess (although she is laying on the floor next to me ) I hope you find a good home for her, or her owners. Poor girl, although she looks very at home with you. OH MY GOD....she is gorgeous. Your my hero for taking her in. If you take her to the Vet and need some help...I cant promise much but I would be willing to help out. She reminds me of my Cinnabear. it brought tears to my eyes and a smile to my heart knowing she is being loved and cared for. You look like you have known each other forever. I havent been on chowchow.org that much...but am glad I found the time to log on tonight. I will be checking on her status! Just an FYI for people west of Ohio. I will be traveling RT70 west to Nevada later in May, possibly the 20-24th. So if anyone out west of Ohio is interested, I will be in a neighborhood near you, the 3rd week of May !! With a couple of days under her belt, she is really feeing better, and not antsy at all. Must be a relief for her to be able to sleep through the night, not looking over your shoulder !! I will try to contact a sympathetic vet on Monday, to get her checked out. Someone PLEASE help find her a home !! How long do you have until you move? Is that the Nevada trip, third week in May? Call animal shelters, chow rescue if anyone reported a missing chow. I talked to the "finder" of this dog again today. He has checked with the humane society, dog pound, and dog warden. No one has reported this little girl missing. Her found ad has been in the paper for 5 days. Apparently, the owners DON'T want to find her. Believe me, I would LOVE for her REAL FAMILY to be reunited with her !! We ALL know what it is like to lose our baby's, and I hope her's wants her back. Keep your eyes and ears peeled for a nice home for her please !! I sure hope that you find her a home shortly since we all know that you cannot take her to your new home in Nevada. Poor little girl...hopefully someone here can take her. Don't worry about a place for her to go before you move, if Ski or PJeanfils can't adopt for some reason I have room. Enjoy her for as long as you can before your move. I-70 is only 2.5 to 3 hours north of me, depending on the point of contact. In the next few days, if her REAL FAMILY isn't found, I will have a vet visit scheduled. If she is up to date on shots, and they give them to her again, does it pose any danger ??? I sure would like to find someone on the site togive her a forever home. I've never been to a shelter, but she's really been through a lot. It would be great for me to deliver her a fantastic forever home in person. She really is starting to get comfortable here !! She has given me more "purple kisses" in the last 3 days, than my last 2 boys in 11 years !!! Maybe it's a "girl" thing !! It just saddens me to think she might have to go to a "shelter" until she has found a forever home. I've never seen a shelter, but I get a vision of a poor puppy in a kennel, with a lot of barking dogs around her. She deserves LOTS of attention and love !! Please feel free to PM me, if anyone can provide a forever home !! Thank you for taking this little sweetie of the streets. It's hard to imagine that no one is looking for her. For the chowgirl's sake, I would list her as "found" on Craig's List. Also, you may want to contact a local shelter that will allow you to picture her in Petfinder.com or Petharbor.com as a their "guest" listing. This chowgirl's family may be looking for her, using one of these resources. As was already suggested, you can take her to a local vet and get her scanned for a microchip. She has a photogenic memory...really! If the "real" owners don't find me in a few weeks, I think that Jeff&Vicki offer a great opportunity for my "Little Missie". I will keep everyone posted on the vet reports, and if I have any luck finding her family. Just an update: Missie is doing awesome !! She has an appointment with my regular vet on Monday @ 5PM !! He has always treated my Chows very well, and seems to understand the breed. I couldn't find any agencies to offer up any financial help, oh well. I hope toreport nothing but good news ! Her coat is really getting beautiful !! I brush her, and cut out a few mats every day. She would love to eat a cat , rabbit or squirrel, and not necessarily in that order !! What a fantanstic little girl she is becoming. She is VERY loyal , and has a unique personality. Ahhh, she is sounding like a real sweetheart. Have you any news about somebody adopting her? Jeff&Vicki seem to be a natural fit. Lost a 16 year old Chow 2 years ago, I believe, and still have one. They are "not so far" outta my way formy trip out West. I need to get her a home quick, while I can still let go !! She is turning into a VERY affectionate and VERY loyal girl !! She gives me dozens of " PURPLE KISSES " EVERY day !! Bear selodom gave any kisses, and NEVER on the face, and Khon would only kiss Grandma. Her affection is overwhelming for a Chow !! She's AWESOME !! I'm hoping to leave with her the week BEFORE Memorial day, if all goes well ! !